Nestled between Connecticut and Massachusetts avenues, N.W., this 9,000 square-foot (est.) residence dates to 1929, and has undergone extensive restoration and renovations which have maintained the integrity of its original construction. The house contains over 100 windows, a step-down living room with extending orangerie, library, dining room, and breakfast room, all of whichopen directly onto an elevated terrace with a pond and fountain. Other features include a great room, chef ’s kitchen, butler’s pantry, wine cellar, gym, 2-car garage, and three laundry rooms. 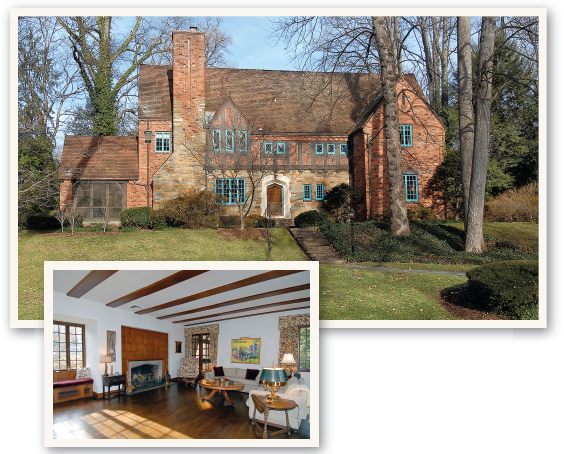 Set on a hill overlooking Rockwood Parkway, this late 1920’s residence features Tudor characteristics and details throughout. The focus of the main level is the formal living room with wood-burning fi replace and French doors which lead to a screened-in porch. The main level also features a dining room with a fountain and tray ceiling, as well as a library with built-in bookcases. The upper level has a master suite, dressing room, sitting area and three other bedrooms, while the third level has two bedrooms and a full bath. The exterior of the house is done in brick and stone and there are front and rear gardens.